stream. 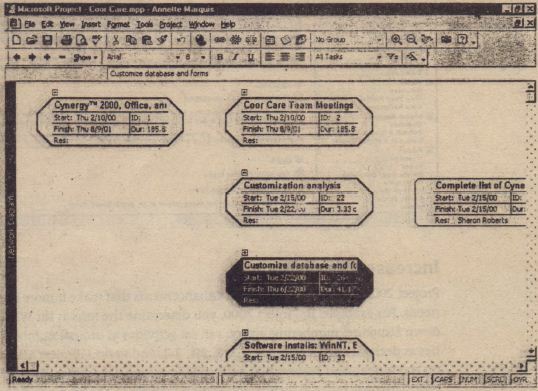 By the early 1990s, there were more than 100 software-management packages on the market. Early packages for used on scheduling people and equipment, and managing costs. There are still a number of project-management software packages, but only a handful are widely used. Project 2000 is the newest version of Microsoft’s market-dominating project-management software. As you’ll see in the that follow, Project 2000 supports many aspects of project management: scheduling, budgeting, tracking, analysis, reporting, and communication. With Project 2000, you can manage multiple projects, share resources between projects, import and export project data, and create reports to analyze and communicate project objectives and progress. 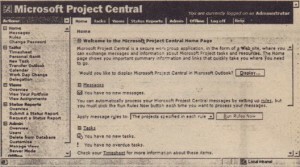 Project 2000 expands the work group features that originally appeared in Project 98. 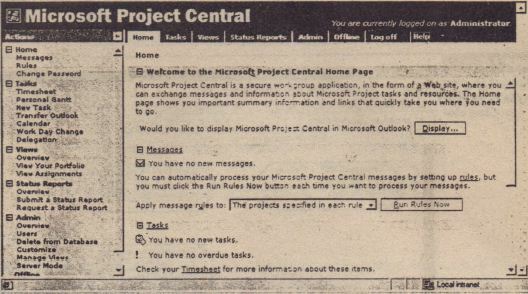 With Microsoft Project Central 2000 and Microsoft Internet .Information Server, members of your project team can view project data by using Internet Explorer or another browser. Information for the project is stored In a Ciabatta base (SQL Server, Oracle, or MSDE-which is a light version of SQL Server) You enable the project’s Web features by simply entering the URL for your Web server. 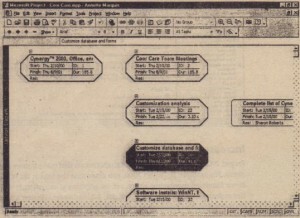 Users log into the server and see analyzed home page for the project like the page shown in Figure 1.1. From the personal home page, users can switch to other views, including time sheets, task lists, and charts. Project Central 2000’s Web features make it easy to communicate information about the project to all members of the project team, no matter where they’re physically located. Even without Project Central, if your Web server has the Office or FrontPage server extensions leaded, you can easily save a project to your corporate Intranet or to another Web site. And you can use the email work group ‘features to communicate by using Microsoft Outlook or another emall program. Project 2000 has a number of subtle enhancements that make it more responsive to user needs. For example, in Project 2000, you determine the format for WBS (Work Breakdown Structure) numbering, so you can set activities as ordinal numbers and sub activities as decimal numbers (1, 1.1, 1.2, 2, 2;1, 2.2, and so on. Project assigns codes based on the format, and ensures that each code is unique. Like Office 2000, Project 2000 supports language packs to display application features in the language you select. If you’ve ever had second thoughts after locking down a project baseline, you’ll appreciate Project 2000’s Clear Baseline feature. You can clear the baseline for the entire project or a selection. Months have been added to the list of duration units, so you can enter 2 mon as a length of time rather than 60 days. Tasks can have different base calendars, so a project can reflect time for factory retooling, scheduled maintenance, and other adjustments . that are task- rather than resource-dependent. Project 2000 has a greater range of values for prioritizing tasks: 1 to 1000 rather than the to-step scale used in Project 98. You can IS Sign a priority to an entire project to Improve resource leveling between projects that share a resource pool. Tasks have another new attribute: deadline dates. Deadline dates are different from constraints; deadlines don’t affect the project schedule calculation, but they provide needed information for management control of the project. Assign deadline dates to critical tasks, and you can quickly view the tasks that were not finished before the deadline . fields by Using many of the same functions you use in Excel (see Figure 1.3). customization doesn’t stop with custom fields. You can customize the forms that you use to enter data about project tasks and the people who work on them. When you customize a form, you can use list box controls for more accurate data entry .
. Project 98 provided good support for Visual Basic for Applications (VBA),increasing Project’s viability as a development platform. For Project 2000, Microsoft has exposed even more project objects, which results in increased programmability. you can use VBA to Protect 2000, but you . 0 they you load COM objects that extend the functionality of Project 2000. If you need more cuscustomization ‘than custom fields and forms included in Project 2000 provide, you can create user forms and project level variables in VBA. As in the Office applications, you can.specify a default Save path (finally rather than switching folders each time you,start a new session of Project or save a file. There’s also an Auto Save option as there is in Word and Excel 2000.
be configured to work with Project. In the next chapter, we’ll walk through the design stage of a project to learn about Project 2000 components activities and resources in more detail “Understanding Project Mismanagement Tasks,” focuses on project management tasks used in the development stage .